NO HURRICANE FLORENCE DAMAGE!This is a little "ship" built by the well-known and still operating T.D. Vinette shipyard in Escanaba, Michigan. To say her construction is robust or like a battleship would be accurate. She has a sea kindly and efficient hull with her high bow, canoe stern, reverse windshield, and displacement hull. Her lines are strong and sure to be a major attraction wherever she travels. The engine is a 2000 John Deere Model 6068 with only 1,300 hours. The transmission is a 2000 Twin Disc MG-506R transmission turning a 30" wheel. These are all the things you want when you are looking at rough water or long distances on your cruising itinerary.She started out looking a bit different and the last owner undertook a major refit of the vessel enlarging the aft stateroom and top deck. There is a swim platform and dinghy davit system added to the stern and an aluminum supported soft top over the aft deck and flybridge areas. There are large interior spaces that will make cruising a dream and the exterior spaces, side decks and high bulkwarks make maneuverability safe.The current owner was a friend of the past owner and purchased the boat from the estate, vowing to complete projects and make the boat a special boat. He has completed his promise. With consistent care, minor and major system upgrades, additions and subtractions of equipment, and interior refurbishment with teak and holly laminate, updated salon settee and chair, and new fabrics throughout, IRONY will not disappoint and is ready to take you most anywhere you wish to go in safety and security.If you are searching for a steel passagemaker with truly unique, sturdy, and masculine lines this could be your boat! United Yacht Sales New Jersey would love to guide you through a personal showing of this 44' Custom Thomas Dale Vinette 1974. This yacht for sale is located in New Bern, North Carolina and priced at $119,000. For a showing please contact us by filling out the form on this page and we will get back to you shortly! Step onboard by way of the wide side decks and head forward to the bow where you will find plenty of room and an added storage box along the port side. As you maneuver aft you will find access into the salon through either a port or starboard side sliding doors. Make your way further aft and up a few steps are the helm and aft deck areas. The helm is centered and offers a large helm seat and excellent 360-degree visibility. All instrumentation and gauges are within easy reach. There is a small doorway used as a pass-through between the salon and helm. Behind the helm is a large aft deck with a seat aft and (4) folding deck chairs, a built-in table is forward and access to the swim platform and dinghy davits are aft. Overhead is a heavily built tubular aluminum supported Sunbrella Grey soft top.Back to the starboard side sliding door, you enter the salon. Immediately you are in the pilothouse and lower helm. The area is large and offers excellent visibility and all gauges and instruments are within easy reach. The salon is large and offers large windows for natural light. The port and starboard doors have bi-fold screen doors. Along the port side is a chair with storage and along the starboard side is a L-Shaped settee with a coffee table/ottoman with built-in cup storage. The flooring is laminate teak and holly. There is a large see through into the port side dinette area and aft is access to the master cabin.Forward and down three steps are galley areas. To port are fore and aft facing seats with a large table in between, easily seating four. Outboard is a continuation of the table making an outboard shelf. There is storage under the seats, as well as two storage drawers under the table. Across from the dinette is the galley area. 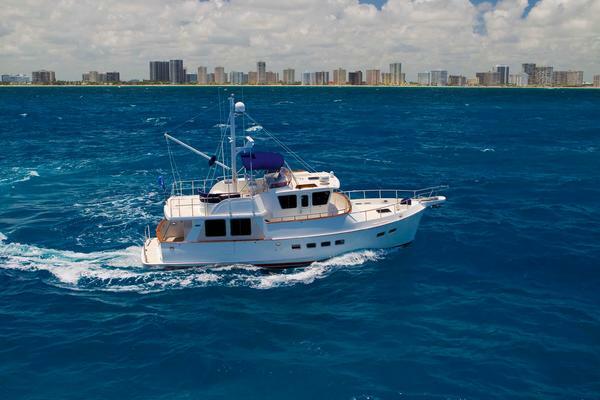 The L-Shaped galley has Formica countertops, a large sink, appliances, and ample countertop food preparation and storage area with drawers and cabinets.Further forward and along the port side is the day head with toilet, vanity and sink. All the way forward is the guest cabin with a V-Berth. The large cabin has plenty of storage and a hanging locker.Back to the salon and aft is the master cabin. The large cabin features a centerline queen berth and plenty of room to maneuver around. Aft and to port is a large cabinet with drawers and desk. To starboard is the head area, larger than most apartments! There is a separate shower stall, large sink and head. Outboard is plenty of room for storage. The galley is down from the salon and along the starboard side. A large galley with plenty of food storage and preparation spaces. The dinette is across from the galley and offers fore and aft seating and an open aft section of the bulkhead making direct communication with the open salon. Updated electrical systems with new panels exceeding ABYC standards using Blue Seas Panels. A large engine room is easily accessed by lifting the galley steps. Once inside the engine room it is a stand-up compartment with easy access to all machinery and tankage. Extraordinarily clean bilges. A beautiful steel hull trawler that has been well cared for and updated. IRONY is ready for new adventures and your little ship will take you there in comfort and safety.Easy to see in New Bern, NC. No Hurricane Florence Damage.